Disclaimer: I’ve previously worked with artist/illustrator Rory Lucey to commission artwork for a podcast in the past, but I also pre-ordered his new title “Jonesy” because both the book and the illustrator are delightful. It’s late October, so you’re probably either finalizing your Halloween plans or are already getting a jump on wish lists for the upcoming holiday season. And I’m sure there are a few of you who have said to yourselves, “Hey, it’s October 26th … that’s halfway to Alien Day!” It’s to you horror-loving, gift-giving, Alien fans out there–along with the cat-lovers among you–to whom I’m speaking today. You see, there’s a new, beautifully illustrated companion book to Ridley Scott‘s 1979 masterpiece that retells the Alien story from a whole new angle. To be specific, it tells the tale from the never-before-seen perspective of one of the two survivors: Jonesy the cat. 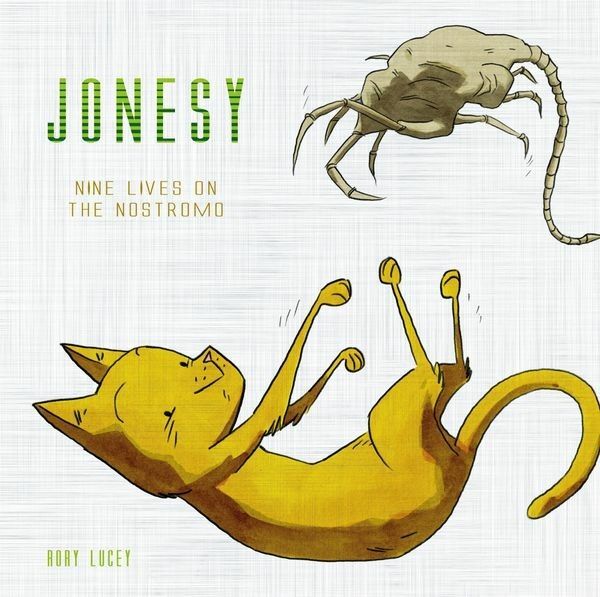 In “Jonesy: Nine Lives on the Nostromo”, Lucey restricts his field of view to that of the title feline as the cat winds its way through the fictional space tug and occasionally checks in on the human crew. The illustrated book, which plays out more like a dialogue-free graphic novel than a kids picture book (by far), exists on the periphery of the main story in Alien while also threading its way into the narrative as Jonesy interacts with Dallas, Kane, Ripley, Ash, Brett, and more, including the alien menace itself. Rest assured that Jonesy still makes it out alive at the end of the telling, thus preserving continuity, just as the crew are still resigned to their fates … off the page, of course. Lucey had the tough task of keeping the tension of the original film while also delivering a whimsical tale of a cat roaming around on a spaceship; he strikes the balance perfectly well. As the crew wakes up and stretches, so does Jonesy. As they eat, so does Jonesy. As they investigate the strange happenings aboard the ship, so does Jonesy, though the cat fares much better than the humans do. Half the fun of looking through this book is discovering what he’ll do next, but the other half is making the connections between Jonesy’s escapades and the peril that’s playing out in the film. For example, Jonesy wants attention when Kane is laid up in the hospital with the facehugger still attached to him; this never appears in the movie but it’s entirely possible when considering cat behavior. Or take Jonesy’s own personal discovery that the alien creature bleeds acid, or his own cat-style take on the “chest-bursting” scene. These little one-offs are fun riffs on the most infamous moments in Alien, but Lucey hides deeper cuts still throughout the book. Even his palette, which paints each page with a pleasing watercolor-like array of colors, changes to fit the mood of Jonesy, the tone of the narrative, and even the ambient visuals in Scott’s movie itself, like the rotating amber lights of the Nostromo’s warning system. It’s worth watching the movie again with this book on hand to follow along with Jonesy’s story in a sort of second-screen experience. The relatively short story is just as fun to read in one sitting as it is to visit again and again, and at a price this low, it really is a steal of a deal, especially for the Alien fan(s) in your life. 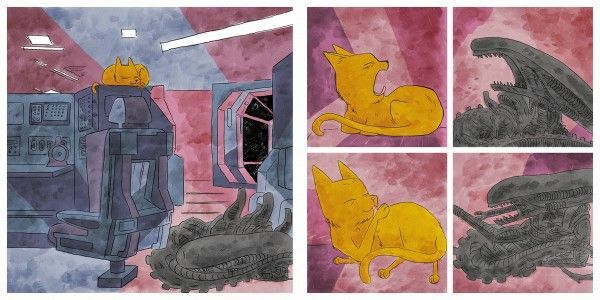 This full-colour, illustrated book offers a cat’s eye view of all the action from the movie Alien. With new and original artwork by artist Rory Lucey, this is the perfect gift for all Alien fans (and cat lovers).